The recent wave of hostile, xenophobic, discriminatory and racist discourse and actions against Muslims in the European countries have been alarming following the so called “Syrian refugee crisis” in Europe and emergence of DAESH attacks throughout Europe. Hence, Islamophobia became an acute risk and a threat to European peace and stability. To increase the awareness towards Islamophobia, in 2016 SETA started to publish an annual report, namely “European Islamophobia Report”, which covers the Islamophobia and related events in 27 European countries. 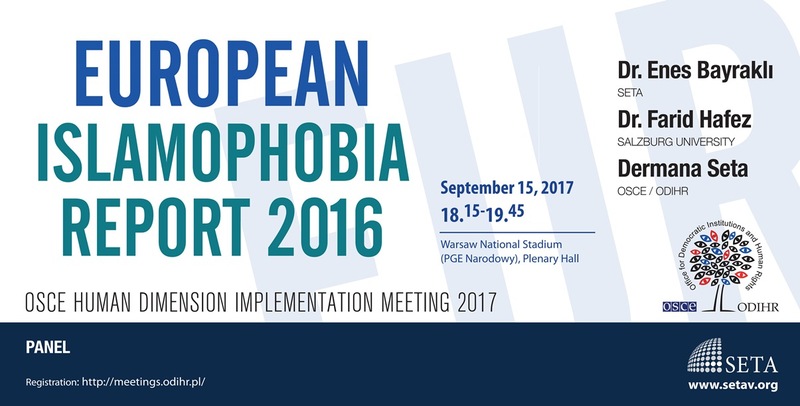 On September 15, 2017 SETA will organize a side-event on the issue of “Islamophobia: A Threat to Peace and Stability in Europe” in Warsaw/ Poland during the “2017 Human Dimension Implementation Meeting” organized by OSCE Office for Democratic Institutions and Human Rights (ODIHR). In this side-event, the findings of the past year’s report and the events related to Islamophobia happened so far in European countries will be discussed. Panelists of the side-event include the editors of “European Islamophobia Report” Enes Bayraklı and Farid Hafez, and Dermana Seta from ODIHR. In the light of current developments, the event will serve to draw attention to the rising level of Islamophobia in the European countries.